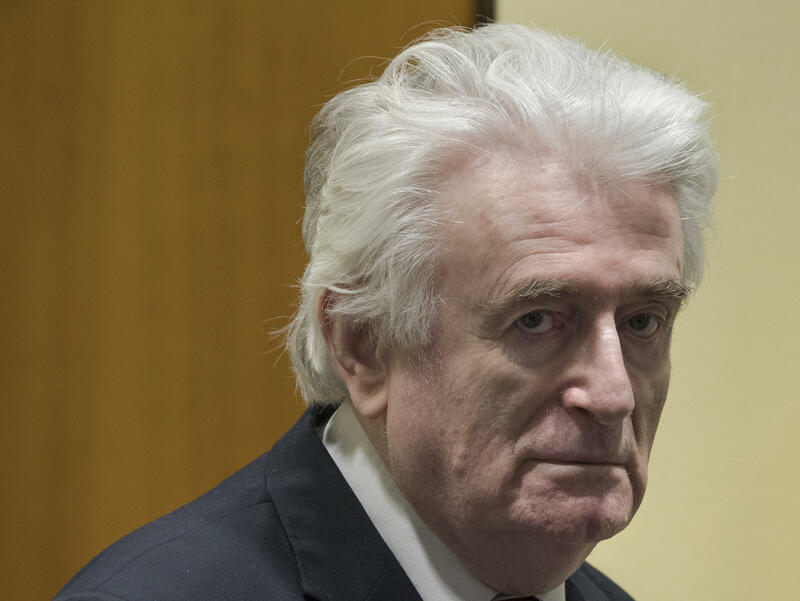 Former Bosnian Serb leader Radovan Karadzic enters the courtroom of the International Residual Mechanism for Criminal Tribunals in The Hague, Netherlands, on Wednesday. Appeals judges of the U.N. War Crimes Tribunal for the former Yugoslavia have upheld Radovan Karadzic's conviction for genocide in the 1995 Srebrenica massacre that claimed the lives of some 8,000 Muslim men and boys. Wednesday's ruling will resonate in Bosnia – where the war claimed at least 100,000 lives, where ethnic groups are still divided, old animosities are still strong and Karadzic is still seen as a hero by many Bosnian Serbs. For years, there were rumors that Karadzic was in Bosnia or in Montenegro, hiding in monasteries or even caves. There were also reports that NATO peacekeepers based in Bosnia knew exactly where he was but declined to arrest him. As it turned out, he spent most of his time on the run hiding in a Belgrade neighborhood of anonymous-looking high-rise buildings, where it was easy to blend into the scenery and lose one's identity, especially if in disguise. Originally trained as a psychiatrist, Karadzic as a fugitive passed himself off as an expert in what he called "human quantum energy." He used the name D.D. David, or Dragon Dabic, and gave lectures all over Serbia on alternative medicine. He even had a website and was a regular contributor to the Serbian alternative medicine magazine, Healthy Life, signing off his articles as a spiritual researcher. His editor was reportedly shocked to learn his true identity. The Bosnian Serb leader remained a fugitive for so long thanks in large part to a strong support network of hard-line nationalists and help from the Serbian Orthodox Church and protection from high Serbian authorities. His arrest came just after a new government was installed that was keen to end Serbia's international isolation – and that depended on handing over remaining war crimes suspects to the International War Crimes Tribunal. Karadzic followed Milosevic's example of using the courtroom for political grandstanding. He insisted the tribunal had no right to try him because he claimed he had struck a secret deal with then-U.S. envoy to the Balkans Richard Holbrooke. Holbrooke denied the existence of such a deal.